This post is of how went about designing "Source It" - a local product search engine in 50 hours. The event started on Friday evening with presenting a rough idea to participants, in not more than 3 minutes. The idea was to provide a platform to immediate shoppers with capability to search the inventory of local shops and provide the user with best options. The first impression I had of the idea - it was overwhelming. Specially in India, there are hardly any shops in non-branded segment with computerized inventory system. In such a scenario sourcing the inventory from this large segment is not possible. This is where we adapted our idea and narrowed it to shops which maintained a computerized inventory system. Where do your customers come from ? Do they live near the stores or come from far places ? How do you reach your local customers ? Ads, banners etc. ? What kind of research do customers often do before they come to stores ? Is there any difference between online and in-stores product catalog ? Is there price difference b/w online and in-stores ? Is online sales affecting in-store sales ? What are the strategies to counter it ? What kind of location based marketing strategies used ? For an international sports brand company, the way they operate is through a franchise model of stores. Most of advertising is handled by the company rather than franchise itself. They are obligated to sell at the printed MRP, and does not have any leeway in giving discount. The inventory data is only provided through partnership at company level and there are very few instance of that happening. The mode of local advertising for most companies is through window advertisement, banners and yellow page service like Just Dial. A yellow page service sends the leads of customer along with very generic information. For e.g. 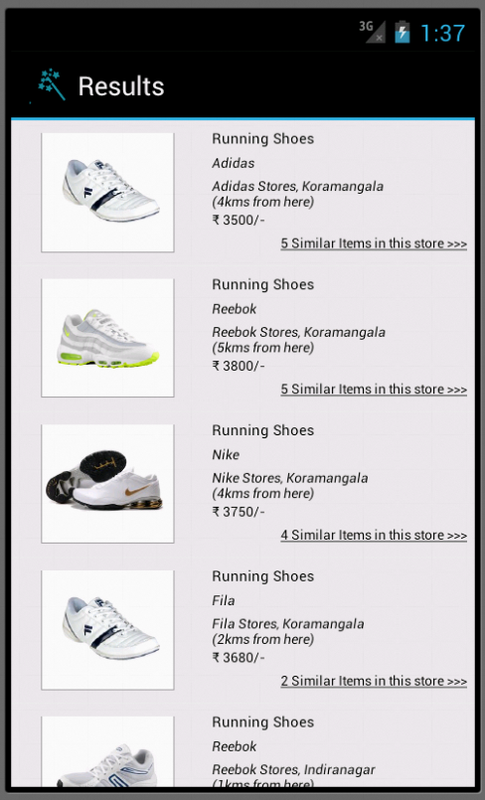 they would message the sport stores in a neighborhood about a customer looking for shoes, but will not be very specific about what type, brand, price range etc. If a customer walks in with a particular product in mind, 80% of the sales is deemed done by the staff. They never let go of such customers and procure the product from other stores if they don't have item in their inventory. Through the above data, we realized a user who has very specific needs is of very high value to retailers, as well as our product differs from any yellow page service by serving very specific needs of our users. The inventory is still the toughest nut to track. At present the approach is to tackle it with appropriate organic growth strategy where stores in a specific neighborhood realizes the benefits of such a service and pro-actively integrates with it rather than separate negotiation with each of them. Problem of a multi-sided market and playing a broker between parties is you have to juggle two balls, on one hand you need to have users to convince the retailers of value they are going to get by adopting the platform, on other hand users are not going to use the platform unless there are host of options available. What would you like to buy locally ? Do you own a smart phone ? How do you use your smart phone for shopping ? How do you find local shops ? How do you find shop when in urgency ? How do you find what you are looking for ? How many shops you hop to get a particular thing ? Do you check prices online before checking out local markets ? The response was overwhelming positive and gave us confidence that we were solving a real customer problem and not chasing a fancy day-dream. Based on the response, and to communicate this user problem for the demo, we chose a novel way by creating a video. Thanks to Shayon for volunteering as our customer. Since the application was supposed to be used by the user on the move, finding products in their neighborhood, it made sense to create the prototype mobile application. We chose Android because of our familiarity with the platform. There were many learnings creating a prototype. To start with, we overcomplicated what the prototype was going to do and were soon bogged down by solving what could have been easily avoided. For e.g. we tried to have a database of products and create multiple tables to support the search function. After Yak Shaving for a good time on Saturday, on fresh Sunday morning we realized we could maintain the product data in code itself rather than database. As well as storing all the specific data, we could rather generate random data on the fly like distance of store from the current location. Thanks to the designer in our team, the product looks very slick and professional. Playing the ThoughtWorks University trainer role for good part of 2012, I already knew the importance of doing dry runs before the demo. As a team we decided on what roles each of us are going to play, practice our lines as well as made sure each of us were on same page regarding the product capabilities and vision. There is no doubt this is a real problem, and if we are able to crack it somehow, it is going to be big. Cracking the inventory puzzle is going to be the crux of this problem. Shiv Kumar from Exotel shared with us milo.com, a similar product in US is doing something very similar. This was an eye-opener since we were not aware of it. Checking out milo.com we realized how improvement can be made to our solution. The code for prototype can be found on Github. Overall it was an amazing experience and I hope this experience report helps others and encourages more participation in such events. Back from #In50Hrs - We Did It !!! As covered in my previous post, this weekend I participated in @In50Hrs. The event started off on Friday evening with the IdeaSmiths putting their best foot forward in pitching their ideas to other participants, mainly developers and designers, in order to have them join their team and hack around continuously over the weekend to come up with a convincing demo for Sunday evening. I had an exciting and amazing learning time during the whole event, and I want to share it with others who are sitting on fence, trying to decide whether to relax over the weekend, or to spend sleepless night trying to bring fruition to an idea which is not theirs, teaming up with people whom they have just met. I want to thank the wonderful effort put in by Vijay Anand and Shayon of In50Hrs. This event would not have been filled with so much learning without the mentors who volunteered their weekends to direct bunch of naive and totally confused young minds. All the mentors for this event were very approachable, and I want to specially thank Mr. Ravi Shankar, Atif Haider, Joylita and Deepak Shenoy for taking special interest in our group. The jury for the Sunday evening demo included many entrepreneurs who have been on the other side of the table, giving demo to their prospective investors. It was very evident by the way they empathized with the participants and encouraged them for their effort. Their questions and suggestions really checked the idea thoroughly and I will try to assimilate their wisdom in later posts. Last but not the least, I want to thank my team mates - designers Shashi & Gurpreet from National Institute of Design, and Joseph from Chennai. We had a wonderful time and learning experience, and this journey would not have been so much fun without the respect and appreciation we had for each other. It was such a pleasant surprise how team jelled and made an impressive demo just in time. As it was evident from our demo, there were no individual super stars and all of us played a crucial role which was sadly lacking in many of the other teams. To end it on a happy note, our Team "Source It" not only won appreciation from crowd, but jury too and ended up being one of the top 3 teams of the event. Congratulations Team, we did it !!! and thanks to all the mentors and organizers for their hard work. And thanks to Shayon Mukherjee for sharing this. A realtime app to record and distribute information about participants at exhibition to the sponsor/participating company stalls. The idea comes from the personal experience of the IdeaSmith, Satish. When he was at a real estate exhibition where after dropping his visiting card at the registration counter all he got were telemarketing calls. The idea explains itself. Tailored to Indian context, where 32% of population owns 2-wheeler compared to 2% who owns a car, the idea is to allow to rent out vehicles including 2-wheelers, with all the security related promises of AirBnB. The country where you are frisked at every gate for no reason, where the landowner is legally mandated to inform local police station about new tenants etc., a facility which rents out vehicles to strangers is going to freak out security agencies. Again, in a country where no one thinks twice before breaking a traffic signal, picks up a street fight, or damages public property with impunity, expecting to respect other's property is highly doubtful. The challenge for this idea is how it adapts to Indian context. Purchasing grocery is a tedious and time consuming task. The idea is to make it easy to order the usual set of monthly items by introducing a concept of bundle. A bundle is a template of items selected based on consumption pattern of a household, which can be quickly added to your cart and ordered. If a bundle does not suit your need, you can customize it and save it to be used as a template in future. Pre-populating shopping cart with bundle items is going to ease over adding items individually, as well as the retail orders don't vary as much month to month, hence will enhance ease of shopping and user experience. Also, from the vendor side, the package of products rather than individual items improve the inventory management. The crux of the implementation, like any other online retail offering, is going to be fulfillment. As of present, the fulfillment is going to be outsourced. The only differentiation that this idea have is a different user experience of online shopping. Those ideas are very easy to copy, and hence does not have a first mover advantage. The idea of VidzMe is to be a private video blog of an individual. 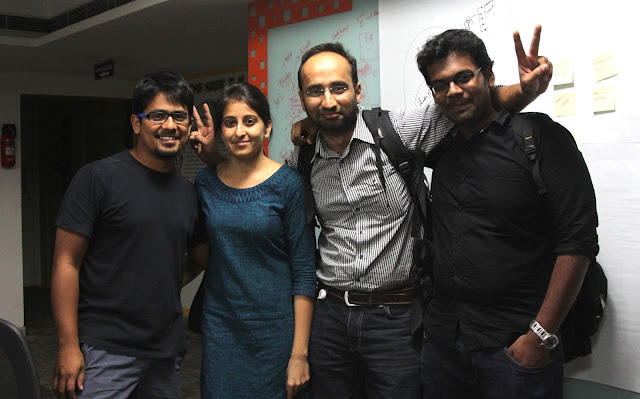 The pitch was very energetic and passionate, and lot of confidence in the idea. Harmeet has been completely invested in his idea, and has travelled from Hyderabad to be present for this event. Video blogging is not a new idea, there are already many providers with similar services. The challenge for this product is going to be differentiating itself, as well as creating a revenue model to sustain the platform. In the current scenario where you have different sources for same information, News Dorm wants to be one place for all news item. That way you can follow a topic and get information from different sources at central place, discussion happen at central place as well as you can do new topic discoveries. The idea has changed from the initial pitch, to the time it was pitched to me 1-on-1. I would take it as a good sign to adapt based on feedback. One of the strong points about this idea is it caters to a niche. Another of a bright chap in the event, Shahnawaz has been very confident in promoting his idea. The vision of Course Den is to introduce disruptive changes in the educational sector through technology. Implementing it piecemeal, the goal for the next 2 days is to build an ebook reader which is going to be used to distribute copyrighted, expensive content that publishers are generally unwilling to share in digital format because of the fear of copy and re-distribution. There are many existing solution, foremost of them being Kindle. The next one that pops up is Safari Books Online by O'reilly. The challenge for this product is going to be user adoption. In my opinion, this may be one of the most audacious idea ever pitched in a 50 hrs development event. The idea is related to displaying augmented reality on piece of any material using mobile phones. The idea as well as the pitch was too complicated for me to process properly, hence I will leave it there. I will be looking forward to the demo of this idea and see what the Idea smith had in his mind. Suppose you come to the city for an interview and then realize you forgot to pack the formals. Not only you need to locate an apparel shop, but the one that serves formal clothes. Over that, if you are specifically interested in the light blue color shirt, that gives you extra confidence to crack those interviews. 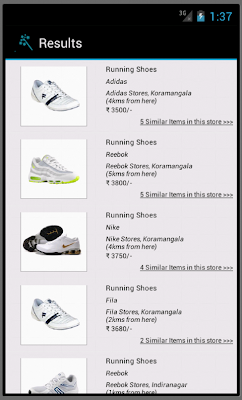 Shop Hurry serves this niche of locating an item zeroing to the specific user need. The original idea also catered to filter the result based on inventory of items at each shop. But even thinking about tasks of syncing inventory of a block of city looks overwhelming. The challenge for the app is going to be to do what it promises, which looks like a very audacious attempt to rewrite the rules of the search industry. Dheeraj's idea is to build engagement platforms for attendees at conference. The tools include an online transfer of voice to be used instead of passing around mikes, having the slides and other distributable of the conference handy on the app for quick reference, as well as having a quick look up of who's who so that you can start on opening conversation. 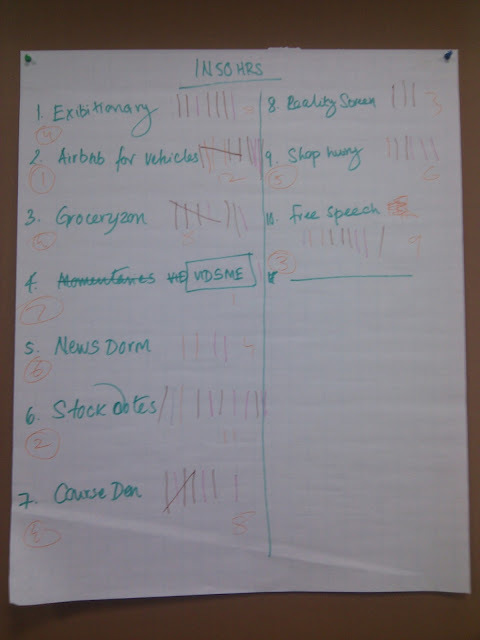 This is an experience report of the first day of #in50hrs event currently going on in Bangalore. It has been put together in limited time, under constrained interaction with other participants at the event. The ideas as detailed above are my understanding of what their owners were trying to pitch, and there are chances of errors based on interpretations. Today, I attended a Service Design Workshop conducted by Adam StJohn and Markus Edgar where they shared many tools and tricks to come up with good design. One that sticked was the Dramatic Arc. The Dramatic Arc goes like Boom - Wow - WoW - WOW - BOOM - ahhh... where obviously no. of CAPS in the letter suggests the energy in those phases. 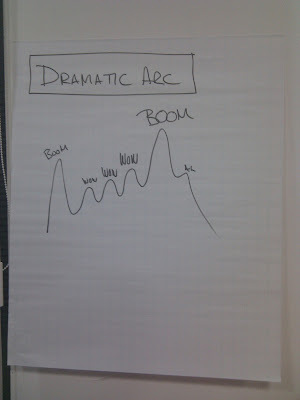 He used the James Bond movie screenplay as an example to explain the Arc. It starts off with a Boom, an event out of the un-expected, medium in intensity, just like the opening scene of James Bond movie with car chase, scenic surroundings and a very high octane action. After this opening Boom, it is time to get back to reality. James goes back to London, gets rapped by "M", finally gets a go ahead on a new mission. In the next few scenes we see the lul turn into Wow to WoW to WOW. Taking the expectation down from the opening Boom, to Wow and then building up to WOW, we are ready to dazzle the audience with the final BOOM. This is more like finale, where you blast and burn the rest of surviving pieces of your set. Casino Royale, again does justice to BOOM, by sinking a complete building in Venice. Apologies for low quality, but I couldn't get one with better quality on YouTube, let me know if there is a better quality, I will update the blog. It is not over yet, we have the final Ahh... moment remaining. The one where you say Good Bye. The Ahh... moment should make the feeling of end sink in, and let you enjoy the few passing moment. 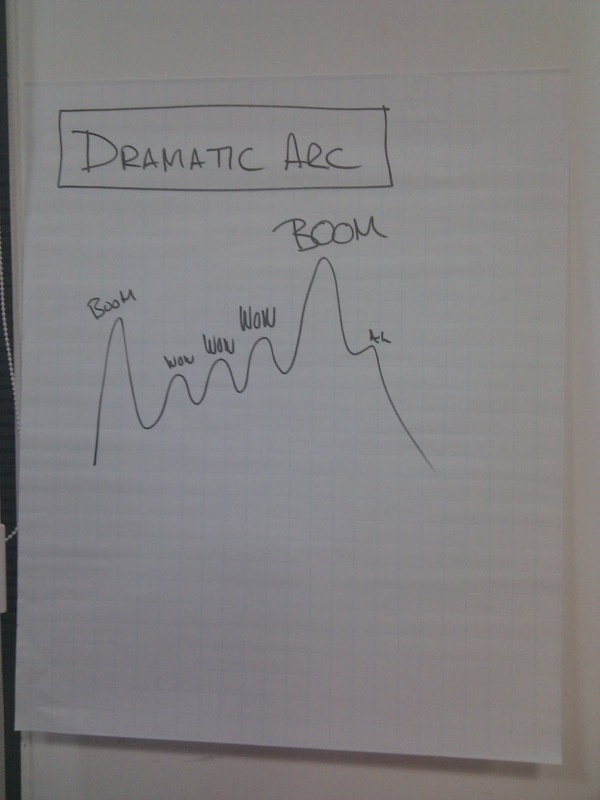 What Adam and Markus suggested was to know and use this Dramatic Arc while designing services, either if you are designing a restaurant, or even a website. My sincere thanks to both Adam and Markus for sharing this wonderful secret sauce of Service Design with us at ThoughtWorks Bangalore office today.